One thing I've always been drawn to is personality tests or information about your personality. There's something so fun about learning more about who you are and what your skills, likes, dislikes, and passions might be. Of course, I think that any personality test - no matter if it's based on psychology or planets - is flawed. These personality tests were created to explain billions of people. So like I say with most things - take what you want, leave what you don't want. Some of it isn't meant for you. At the very least, these personality tests are great reflection tools. It really helps you to say, "Oh, I'm totally comfortable in social situations," or "Actually, I hate being the center of attention." I've put together a small list of free personality tests that will help you learn more about yourself. The first three are based in psychology while the last three are more woo woo. Still, they're all fun and I believe there's room for a little bit of both. The Myers-Briggs personality test is one of the most popular personality tests that I know of. 16Personalities is a free version of this test that tells you plenty of information related to your type. Be as honest with yourself as you can when you answer these questions. This test is pretty similar to the personality test above, but it looks at slightly different areas of the human personality. It's another way to get even more information about your personality. This test takes a little while, but it's completely free and it has tons of information. Here's a quick emotional intelligence test that can help you learn more about how much you know about emotions and how well you empathize with others. If you find that you have a low emotional intelligence score, there are resources that can help you learn more about emotions and dealing with them (which is in the same boat that I'm in, to be honest). If you're interested in your sun sign and reading your daily horoscope, you'll love reading your natal chart. It tells you all about your sun sign, moon sign, rising sign, and tons of other information. There are tons of free websites - like this one - that can make this chart for you and break down what each part means. Your Primal Sign is determined by combining your Zodiac sign, based on the day and month you were born, and your Chinese Zodiac sign, based on the year you were born. Don't worry, there's a website that does all of this for you! Numerology is based on the idea that numbers contain a lot of information about the Universe and people, including you. It's kind of a cool idea since there are numbers and patterns everywhere. There are several important numbers that everyone experiences. Enter your information on this website to find out all about your life in numbers. 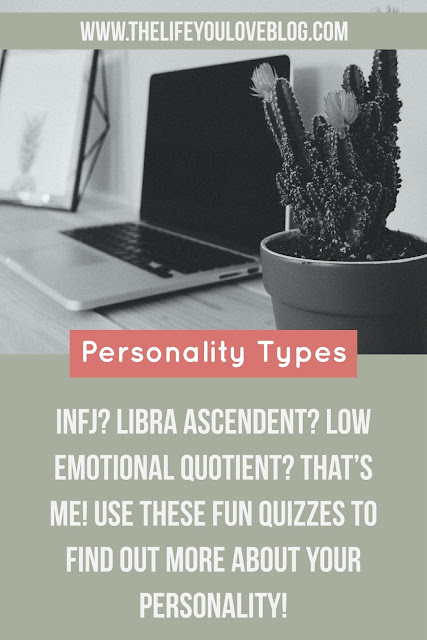 If you enjoyed learning more about your personality, please pin this image and share this post with your friends. Thanks for your support!